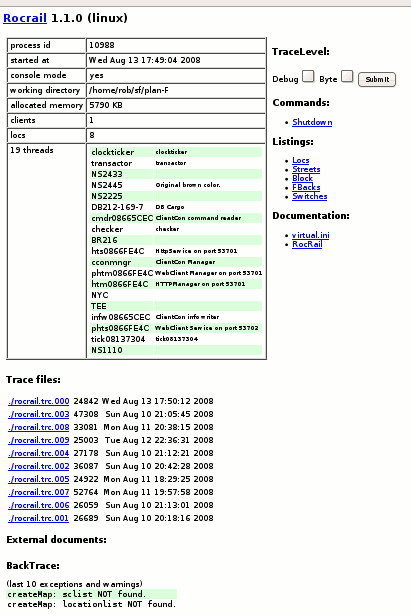 The Rocrail Server Monitor provides basic information and control over the Server from a Web Browser. It runs in a light-weight web server built in to Rocrail that you can browse from any computer that can reach the Server via TCP/IP. This web service is set up by default for most installations. It is controlled by the settings in the rocrail.ini file, and can be modified or shut down from Rocview with the Service tab in the File > Rocrail Properties dialog. By default the Server Monitor is available on port 53701. Note that this is a non-standard port and will be blocked by most firewalls. This service is not available over an Internet connection unless the port has been opened in all firewalls between the Server and the Internet. You will need to configure your firewalls and network to make the Server Monitor available to any computer besides the Rocrail Server. If you have changed the port, you should change the number after the semi-colon (:) to match. This should work for all computers inside the same LAN, as long as the Server computer firewall allows traffic on the correct port. If you open the correct port in your firewalls and set up NAT translation for your Internet connection to point to the Rocrail Server (or it is directly connected to the Internet), anyone in the world should be able to browse the Sever Monitor by using the correct WAN IP Address. Do not open up ports in your router or make the Server Monitor available globally unless you know what you are doing. Anyone can control your layout at any time.